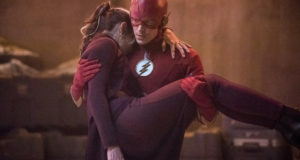 The four-show “Crisis on Earth-X” crossover began with the first attempt at a wedding for Barry Allen and Iris West, and before they were interrupted, a mysterious girl showed up, leading many to think that this star-struck visitor might be a descendant of Barry and Iris. Here at FlashTVNews we are hanging our hats at the notion that she might be Jenni Ognats, a.k.a. XS, who would be grandchild of Barry and Iris; others think it’s their daughter, Dawn. The interview also reveals that she’s listed only as “Mystery Girl” in the scripts, and everything has been so secretive so far. Whatever it is, the producers approached Kennedy for the part and she did not have to audition. The actress also described it as a “cool concept.” Though she has not read fan theories, she is excited that fandom is excited and guessing who she might be playing. “I’m just excited that they’ll get to be on that journey and I’m glad to be a part of it,” Kennedy said. 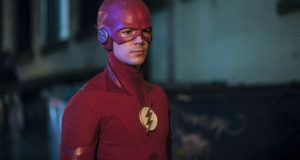 The Flash returns January 16 where it will precede new DC TV offering Black Lightning. Ms. Kennedy is also familiar to Smallville fans as Bette Sans Souci, aka Plastique, who appeared in three episodes over Seasons 8 and 9.